In celebration of Levi Strauss's birthday today, throw on your favorite pair of jeans and a cool t-shirt, then listen to "Baby's Got Her Bluejeans On" by Mel McDaniel or Neil Diamond's "Forever In Blue Jeans." This will really get you in the spirit to mark the birth of the man who revolutionized the way the western world dresses. Need a new tee to go with those jeans? Then check Etsy.com for cool t-shirt designs specifically for cycling enthusiasts. 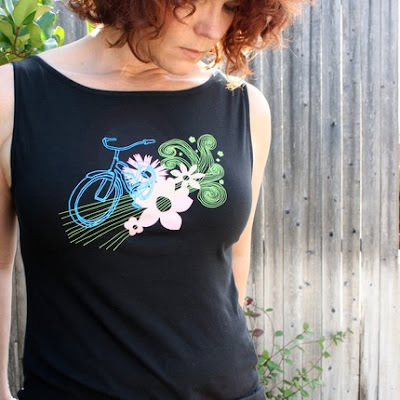 A new T-Shirt maker, Tight Rope Tees, has created a beautiful design which incorporates a bike and floral pattern. The colorful and unique creation is featured on many colors in both a sleeveless and traditional style tee. It's screen printed on 100% pima cotton and no doubt will look hot with those Levi's!